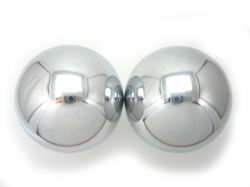 Traditional beautiful chrome steel Baoding Balls you can keep and display anywhere. Stimulate and exercise your hands, fingers, and muscles. No enamel finish makes this great for beginners as clashing the balls will not chip them. We also carry Solid Steel Baoding Balls for those looking for a non-chiming and really heavy set.